Does your restaurant ever lose business due to bad weather? Our premium quality commercial blinds can block the wind and rain keep you comfortable all year round. Keep the view but control the weather. Your customers will thank you for it. Manufactured in-house and back up with servicing and replacement parts. Over 17 years of product development has gone into our blind systems, so you get a stylish product that’s a joy to use. Popular with cafes, bars, hotels and restaurants and the perfect complement to our dining structure range. 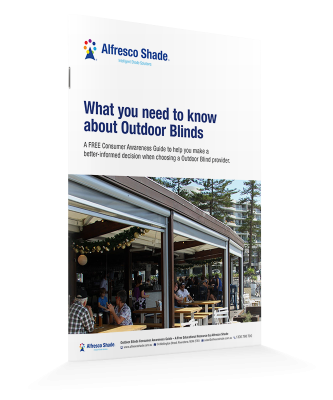 Find out why some of Sydney’s most successful cafes and restaurants love Alfresco outdoor blinds. What you need to know about Outdoor Blinds. Comfortable customers and smart property use. A simple cost effective option for blocking the wind and rain. Your outdoor area buzzing with happy customers dining in comfort. Sleek waterproof design with roller blind convenience. All the refinement and comfort of a true outdoor room. For a weatherproof outdoor dining space.